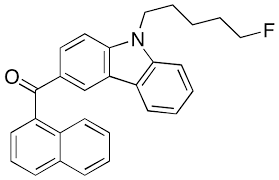 AM2201 is a potent synthetic cannabinoid (CB) with Ki values of 1.0 and 2.6 nM for the central cannabinoid (CB1) and peripheral cannabinoid (CB2) receptors, respectively.1 EG2201 is an analog of AM2201 that has a benzene ring attached to the aminoalkylindole group, positioned adjacent to the naphthoyl group. The physiological and toxicological properties of this compound have not been evaluated. This product is intended for forensic and research applications.